NEW YORK, New York — On September 2 in Stepanakert, Artsakh, Hayastan All-Armenian Fund marked the opening of its largest school campus ever built with the newly constructed 3,500 square-meter V. Jhangiryan No. 11 School. 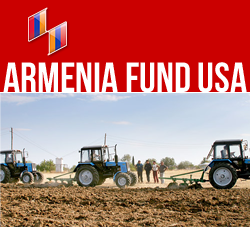 The $2.7 million project was underwritten jointly by the Hayastan All-Armenian Fund U.S. Western Region, through a contribution by Armenian-American benefactors Mr. and Mrs. Gerald Trpanjian, and the government of Nagorno Karabakh. The opening ceremony counted numerous dignitaries in attendance, coinciding with the 19th anniversary of Artsakh’s independence. From Armenia, the esteemed list of guest included Prime Minister Tigran Sargsyan; Deputy Prime Minister Armen Gevorgyan; second president of Artsakh and Vice-President of the Hayastan All-Armenian Fund Board of Trustees Arkadi Ghukasyan; and Hayastan All-Armenian Fund Executive Director Ara Vardanyan. Representing Artsakh, Prime Minister Araik Harutyunyan and Minister of Education and Science Vladik Khachatryan were in attendance, alongside numerous other esteemed members of the administration. The official opening of the extensive three-building campus follows an August 29 tour of the facilities made by Armenian President Serzh Sargsyan, Artsakh President Bako Sahakyan, and Executive Director Ara Vardanyan during a working visit to Artsakh. High-ranking officials of the dual administrations took note of its lush landscaping and distinct architecture, exemplified in its graceful, semicircular glass entrance; sun-soaked, wide passageways that connect the buildings; and the administrative building’s circular staircase, which lends a distinct charm to the foyer. In addition to its gymnasium and administrative offices, and 25 classrooms, the school now boasts chemistry and physics labs, a computer room, a library, and a room for crafts and vocational studies. The campus also possesses a cafeteria, a nurse’s office, well-laid-out emergency exits, and a boiler room. Students will have access to designated grass plots, whose cultivation will be allowed for by means of practical classroom components. This year, 400 high school students will attend the new campus, which can accommodate 560 pupils. In the meantime elementary and middle school students will continue to attend the former school adjacent to the newly constructed building. However, according to Principal Aida Grigoryan, classes are being scheduled to allow them to likewise take advantage of the new school, particularly the playground, gym, library, and computer room. During a September 1 tour of the school specifically for students, faculty, and parents, the younger students were demonstrably eager to inherit the campus and excited to use the facilities that they can already share.